Who will be the coordinator of Winter Bike to Work Day in your community? Be sure you register your community on the website! Over the past few months, we’ve been asking Nova Scotians: Why is Sharing the Road important to you? Share the Road 10 Day Giveaway! We’re bringing our community-based campaign to the next level with a 10 day Share or Tweet & WIN! Join us on Facebook (facebook.com/sharetheroadns) or Twitter (@sharetheroadns) and watch for Winning posts! There will be one post every day. Last night, one lucky winner won a personalized iPod Nano 7th Generation. Road safety is everyone’s concern. Share our posts with your friends to encourage safer roads for all! Safety First- Take your own bike lane wherever you go! Riding on a road without a bike lane? That’s no problem with this graphic light that projects an outlined bike lane behind you at almost one mile away. Share the Road Nova Scotia website launch! 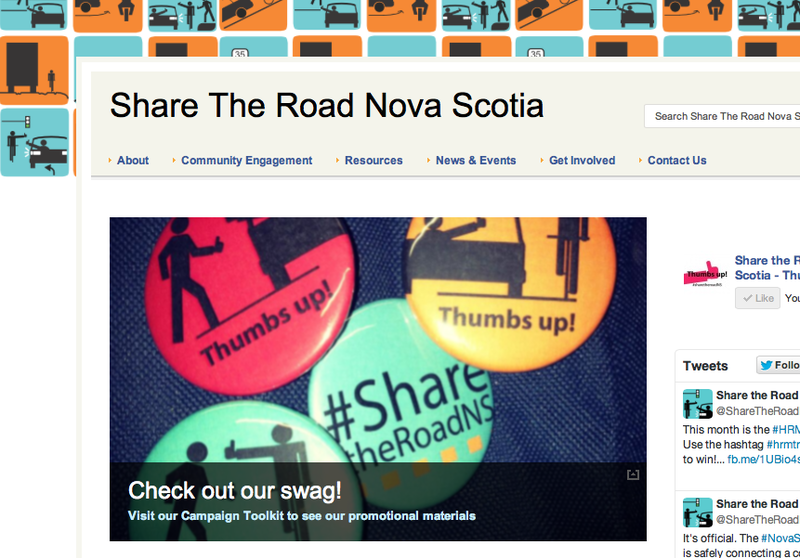 We are proud to announce the launch of our new website, Share the Road Nova Scotia! Thumbs Up! Share the Road Nova Scotia is a community-based Share the Road awareness campaign for Nova Scotia. The goal of the campaign is to promote positive behavioural change and safer sharing of the roads for all road users in Nova Scotia – Pedestrians, Cyclists, and Motorists. Initiated by DalTRAC, the campaign is the product of extensive research and community consultation. After a review of more than 70 Share the Road campaigns from North America, New Zealand and Australia, DalTRAC and interested communities hosted several community engagement sessions (in Chester, Hubbards, New Glasgow, Pictou, and Halifax Regional Municipality) to generate discussion on sharing the road in both urban and rural contexts, and ideas for what a local Share the Road campaign should look like. Information from the community workshops was then used to design a Share the Road awareness campaign for Nova Scotia, which can be adopted by any municipality. For more information, visit the website at dal.ca/sharetheroadns and follow the movement on Facebook, and Twitter.